Observation - sheet of eggs covering an empty pupa - UK and Ireland. 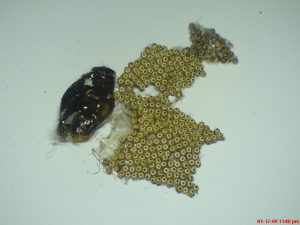 Description: I removed this sheet of tiny eggs from the surface of a tree, only to find underneath a cocoon and vacated pupa. I assumed that a moth had emerged from the pupa and laid the eggs, though I may be wrong. I removed this sheet of tiny eggs from the surface of a tree, only to find underneath a cocoon and vacated pupa. I assumed that a moth had emerged from the pupa and laid the eggs, though I may be wrong.